Road Less Travelled: Bike Ride To The Mecca Of Road trips- Ladakh! Bike Ride To The Mecca Of Road trips- Ladakh! Mountains or beaches is always the question when it comes to a vacation but a land of high mountain passes, frozen lakes, mesmerizing mountain vistas, colossal glaciers is a temptation too hard to resist. Himalayas, a mystic destination that is addictive in so many ways. We embarked on a memorable bike ride to the majestic land of Lamas, dream destination of every biker- Ladakh. The two of us, with our ever reliable and trusted lieutenant 'Stallion' Standard Bullet left for heaven on earth. These unforgiving mountains were our home for 45 days. Fighting high altitude, extreme cold conditions and rugged terrain, pushing our bike to his extreme limit, we rode to witness the best of lakes, deserts, stunning valley, battle fields, monasteries et all. Our slow ride commenced with the aroma of mustard fields and glimpses of water canals, single lane roads and beautiful landscapes painting a beautiful picture of rural Punjab. Of course, when it comes to Punjab how can one not experience the rich Punjabi cuisine and the Lassi. The humble land with its humble people gave us an experience of a lifetime in their Gurudwaras. While one can try and be prepared for a bike trip by ensuring proper first aid kit is available, bike is in good shape and serviced with spares in hand, extra layers of clothing to battle the cold, the fact remains that you can never prepare yourself for everything and that is the biggest lesson that travel teaches you. Change is constant and things might not go as per the plan. We were way too excited to visit the Kashmir valley and enjoy her pristine beauty with an initial plan to spend at least a month in South and North Kashmir but fate had other plans. Unrest in Kashmir valley has become a normal phenomenon but who would have expected a total shutdown and a shutdown this massive that lasted for months. Our able Security forces shot and killed Terrorist "Burhan Wani" which lead to massive protests in the valley bringing normal life to a standstill and all our plans shattered. We were unable to comprehend and come to terms as to why would locals create havoc for killing a terrorist. The day he picked up guns, posed for pictures and was unceremoniously given a poster boy imagine, his days were numbered! With hopes that the situation would be under control and normalcy would return in a few days, we changed our itinerary and headed to Dalhousie for a respite. However, sanity did not prevail in the valley and we were unsure if we should completely abandon the trip and get back. It would have been easy to let go and come back later but with getting our third partner this far and not going to Ladakh did not seem right and we never expected the situation to last for that long. With the impression that this situation is just an obstacle we took a tough call wherein one of us flew back home and the other decided to brave it and ride to Sonamarg. With the valley under curfew, the only option to ride to Sonamarg was with the help of Army. The Indian Army had made arrangements for a convoy escorting Pilgrims to Amaranth Ji Yatra from Anantnag to Gulmarg. With the help of the Army, all night I rode from Anantnag to Sonamarg fighting bitter cold conditions and low visibility plus no network coverage, far away from the stone pelters and thugs on the streets but all this was not without drama and chaos. I was stopped by so called "misguided youth" in South Kashmir and was put through a horrendous experience. Luckily, I was alone and not with my wife. I spent some 10 hours on the streets waiting for night fall and witnessed CRPF being attacked and they were left with no option but to retaliate. These 10 hours gave me a chance to have lengthy conversations with locals about every sensitive topic! Most of them were not happy with what was happening but were being dominated and felt helpless and were forced to go with the flow in order to not be harmed. Something which is never told by the media. The experiences travel life gifts us! After the harrowing experience, maybe had we known what exactly was in store I may have not crossed the valley this way. 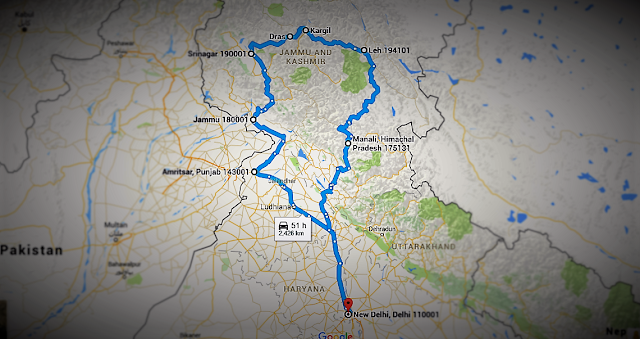 Resuming our dream road trip, from Sonamarg I rode to Leh and Reshma flew into Leh and we kick started our trip! We were so glad to leave behind the Kashmir issues and from Leh we headed to Zanskar valley. Ladakh gave an entirely different version of the Jammu and Kashmir state with a startling contrast to the valley. The place has a sense of calm with the most mesmerizing views, a perfect destination for soul searching. The natural beauty of the place is enough to take your breath away and make you wanna embrace the place for your entire life. A place where the basic occupation is agriculture and tourism away from high rises, polluted environments and stressful life. The almost empty roads, the centuries old monasteries, the loving and affectionate people, the amazing food and of course the breathtaking beauty makes it the most blessed place on Earth. From Leh we headed to Kargil to pay our respect to the martyrs and then back tracked to Leh with a lot of pit stops on the way enjoying the lesser known places such as Likir, Alchi, Chilling. After reaching Leh, we rode to Nubra Valley and Hunder. From battling sub zero cold temperatures, to visiting the second coldest inhabited place on earth, to riding through several high altitude passes with no roads but boulders and crossing one of the highest motorable terrains, the experience has been amazing. We got to relish traditional Ladakhi food at some amazing homestays, met some like minded fellow travellers who had also quit their comforts back home and were touring India, volunteering and helping kids with education. Met many bikers on the way, exchanged itineraries and had the best of apricots plucked right from the tree. The beauty of homestays is that one can actually live like a local and gain more experiences. We were glad that one of our hosts took the time out to give a tour of their in house farm and also took us to their paddy fields teaching us the nuances of farming and treating us to their farm fresh and sweet peas. Also another enriching experience was staying in a monastery and interacting with the lamas, getting to know more about their school, their discipline and having 3 meals with them. Surely an experience of a lifetime. We were also very fortunate to be in Leh while His Holiness, The Dalai Lama was visiting and we got a glimpse of him and were very happy to see this Humble soul. We saved the best for the last. After all this we had to ride back from Leh to Manali. This 470 odd kilometers was the best part of the ride. Riding through slush, encountering boulders, some crazy nallas and waterfalls to sleeping in the middle of nowhere under tents and fighting freezing cold to riding in pouring rain, the ride though the most challenging was one hell of an experience. 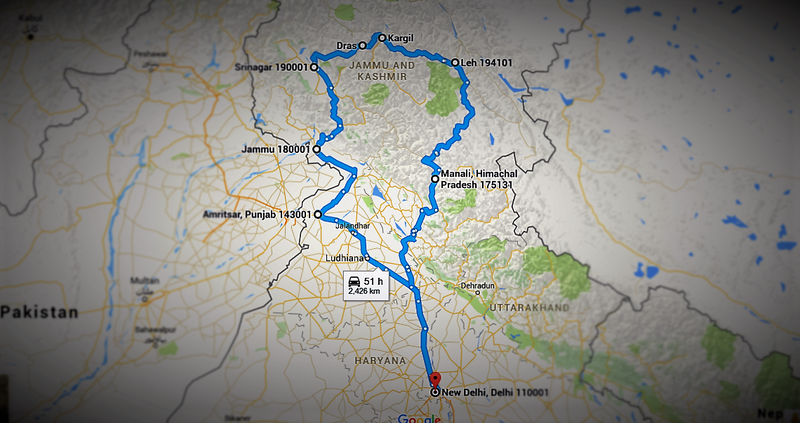 A total of 4130 kilometers in 45 days and still we crave to go back again :) Never will it be enough! Nice one. Would like to hear and see more from your experience of the journey. Thanks Prasad, glad you liked our post. Will write more blog posts. Thanks Aswiin, glad you liked the post. June is perfect time to hit the roads. 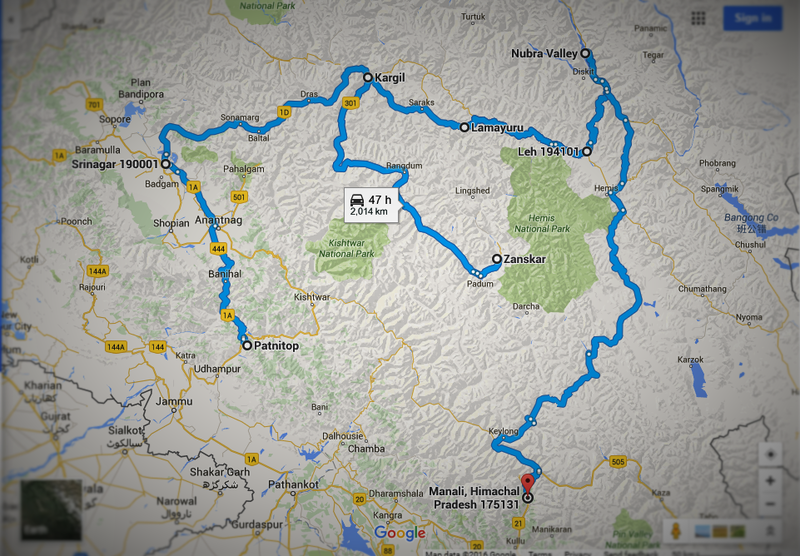 I like best road trip Leh Ladakh. Ladakh has been a clandestine land for everyone. Once you visit this place, you get myriad of spots, amazing vistas, stunning lake and mesmeric hills. These places keep the flow of tourists in full swing throughout the year. You can also enjoy a Ladakh trip in India if you have a desire for adventure.